A one-minute scrambled egg that's grab-and-go easy. Spray small microwaveable cup or bowl with cooking spray. Add egg; beat with fork. Microwave on HIGH 30 sec. Add salsa and cheese; mix well. Microwave an additional 30 sec. or until egg is set. 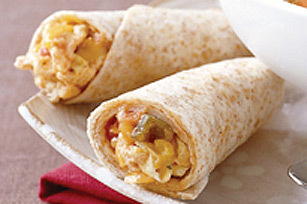 Spoon onto tortilla; fold in opposite sides of tortilla to serve. Add shredded lettuce and a slice of tomato for a fresh twist. A serving of this recipe contains a moderate amount of dietary fibre.